In a bid to provide best healthcare facilities to the residents of Punjab, Mission Tandrust Punjab has been started by the state government. Several welfare schemes have been started under this mission and one such scheme is to provide medical checkup for the residents of rural areas on their doorstep.While providing information, Deputy Commissioner Mrs Gurneet Tej stated that for the success of this mission, Mobile Medical Bus Service has been started in the district. This bus service visits different rural areas of Rupnagar as well as the District Jail and the medical staff provides healthcare facilities to the needy patients. 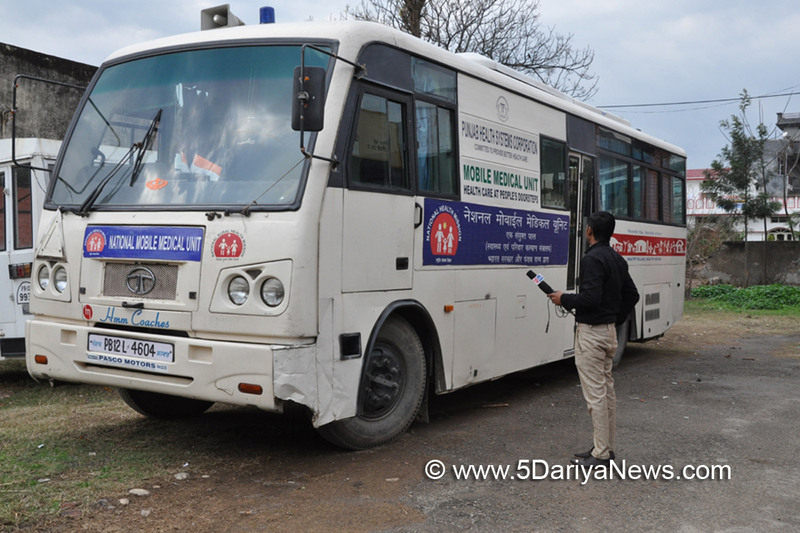 She informed that free medicines are provided to the patients and the facilities such as ECG, lab tests are also totally free of cost.The Deputy Commissioner informed that this Mobile Medical Bus Service is proving a boon to the residents of Rupnagar as it covers all far flung areas of the district. She said that medicines are provided free of cost and on doorsteps of patients such as elderly, physically challenged, children and others who could not go to hospitals for checkup and medicines.The Punjab Health Department provides healthcare facilities to residents of all towns, cities and rural areas and its Mobile Medical Unit provides healthcare facilities to residents of rural areas on all days, excluding gazetted holidays, and every Saturday to the inmates of district jail. Dr Harinder Kaur, Civil Surgeon, Rupnagar, informed that the staff deputed in this Mobile Medical Bus Service, carries free medical checkup of patients in 2 villages and slums, excluding gazetted holidays, from 9 am to 3 pm daily.She informed that this Mobile Medical Bus would visit villages Chandpurseri and Kangar on July 4, villages Jasemajra and Barari on July 5, villages Kalalpur and Ballewal on July 6, villages Asmanpur Upper and Asmanpur Lower on July 9, villages Raipur and Munne on July 10, villages Jhandian Kalan and Jhandian Khurd on July 11, villages Jattwahar and Tibba Nangal on July 12, villages Asalatpur and Lehrian on July 13, villages Musapur and Barwa on July 16, villages Takhatgarh and Tapprian on July 17, villages Dhahan and Gharispur on July 18, villages Aulakh and Binsa on July 19, villages Sarari and Sarthali on July 20, villages Chajja and Chaunta on July 23, villages Abiana Kalan and Abiana Khurd on July 24, villages Dhana and Nangal on July 25, villages Nodhemajra and Golumajra on July 26, villages Madhopur and Dahirpur onJuly 27, villages Rajgiri and Khatana on July 30 and villages Garbaga Upper and Garbaga Lower on July 31. Dr Harinder Kaur further informed that this Mobile Medical Unit would visit District Jail on July 7, 14, 21 and 28, 2018.